Many nonprofits need social media training – they just don’t know it. There’s always room for improvement and unfortunately overconfidence in social media skills prevent many nonprofit staff from getting training that could significantly increase their social media ROI (Return on Investment). Social media best practices are constantly in flux as tool sets change and algorithms are modified. Unless you study Facebook, Twitter, Pinterest. Google+, etc. on a regular basis you may not realize that the best practices that worked six months ago have evolved and some simply don’t work anymore at all. Social media is time consuming and if you aren’t doing it right, you’re wasting your time. I spend 50-60 hours a week studying nonprofits and social media and even with that level of absorption I still have regular “Aha!” moments where I realize I have been doing something wrong or misunderstood a functionality or tool set or incorrectly gaged the pulse of the online commons. No one is immune to making mistakes on the Social Web. 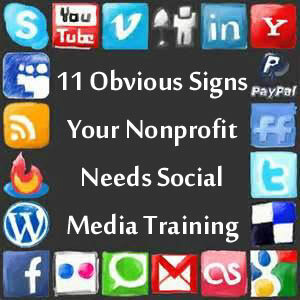 That said, below are 11 obvious signs that your nonprofit may be in need of social media training. If you’re only making a couple of these mistakes or none at all, congrats – your social media campaigns are likely on the right path. More than that? Please be open to the idea that you may need social media training. 1) Your avatar is cropped, shrunk, blurry, or too small to make an impact. The vast majority of logos are horizontal and when uploaded to social networks they either get cropped or shrunk so small that they are visually illegible. Your nonprofit’s avatar is the brand identity upon which your social media campaigns are built and resources should be allocated to ensure that it’s visually compelling and memorable. 2) You are rarely retweeted on Twitter. People follow nonprofits on Twitter to learn about your cause or because they care about the work you do. Give them retweetable content! Let them be activists for your organization and your cause. If all your tweets are marketing or fundraising focused, then your are hampering your ROI. Seriously. If you are not getting retweeted, you are not giving your followers the content they want. 3) Your YouTube Channel is absent of customization and branding. Many nonprofits are neglecting their YouTube Channels. They just think of YouTube as website where the can quickly upload and host their online videos. Login – and logout – as fast as possible. Many nonprofits don’t even bother to upload an avatar or channel background, or add links to their social networks or website. It’s amazing what you can do with your channel by simply spending an hour or two exploring the tool set or getting some good training on the YouTube tool set. 4) You have not claimed your LinkedIn Company Page. Odds are your nonprofit has a LinkedIn Company Page. You need to find it, claim it, set it up, and post at least one update a week. 5) You are ignoring Google+. 6) You upload multiple photos to Pinterest – one after another – on a regular basis. Pinterest is like Twitter. If your nonprofit is always in the “Home” view, odds are you’re cluttering the feed and annoying your followers. Pace yourself. Build your boards slowly. And of course, only post visually compelling content. 7) Your Facebook Page only has one admin. We’re now ten years into the Social Web. Social networks have become an integral part of nonprofit online communications and fundraising. If you haven’t yet created a back-up system to ensure your communities are accessible in the event of a worse case scenario, then you’ve missed a crucial step in the set-up process. 8) Your blog is missing social networking icons, an e-newsletter subscribe option, and a “Donate Now” button. See the social networking icons and he subscribe e-newsletter button in the upper right-hand corner of this blog? Well… if those weren’t there, then I’d be out of business. This blog and @NonprofitOrgs would have gone silent years ago. It’s tragic how many nonprofits blog great content regularly and yet do not have social networking icons, an e-newsletter subscribe option, or a “Donate Now” button prominently featured on their blog. 9) Your e-newsletter design does not include social networking icons and a “Donate Now” button. An e-newsletter design absent of social networking icons and a “Donate Now” button is indicative of organization’s lack of understanding about the power of integrated marketing i.e., merging Web 1.0 (websites, e-newsletters, donate now fundraising) and Web 2.0 (blogs, social networks, peer-to-peer fundraising). Again, its tragic how many nonprofits have spent years using social media and have yet to understand the number one producer of ROI – integrating their Web 1.0 and Web 2.0 campaigns. The majority of nonprofits that use Flickr download their photos from their camera and then upload them to Flickr as they are titled by the camera, such as: 0001212013.jpg. You don’t want promote photos or slideshows that have inappropriate titles. Many nonprofits don’t realize that they can remove these titles with one-click of a mouse, but if they had good training, they would. 11) You’ve not yet viewed your nonprofit’s website, e-newsletter, blog, or social networking profiles on a tablet and a smartphone. Many nonprofits still allocate mobile communications to a distant, far off, in-the-future priority list and that’s a big mistake. Mobile Internet use is on track to surpass desktop by the end of 2013/early 2014 and the vast majority of nonprofits are still budgeting and crafting communications and fundraising strategies built around desktop design and usability. Nothing will illuminate what a grand mistake this is faster than viewing your nonprofit’s website, e-newsletter, blog, and social networking profiles on a tablet and smartphone. Yes, nonprofits miss even the solid basics, and “best practices” of Social Media Marketing and it is the same with most individuals, they are overconfident, and really don’t know what they don’t know and miss the small details which in the long run are costing them dearly over time. Great advice. If you need a hand with any of these, let me know! It’s cause we’re mostly nutcases! Well I am. Good tips though! Among the services I offer arts organizations through my consulting business is social media communications and marketing BUT I believe most arts organizations can do it themselves. I’ve put together a free, downloadable presentation http://www.slideshare.net/lindar/commonsense-media-for-small-arts-organizations for use by arts orgs. What an interesting article that shares practical ideas for fine tuning a media strategy for non-profits and the people who help them achieve their mission like myself! Thanks for sharing your post! You make a lot of good and useful points. I majored in Communication Studies in college and I took a Media class and we touched upon social media and how it can not only help businesses but nonprofit organizations as well. We also focused on media training and the basics of what people need to know to help an organization survive and prosper. With regard point 10. Organisations often post up random pictures of stuff they are doing but don’t add any comments to give it context. So a couple of people looking at a laptop may have a lot of meaning to whoever was there but to anyone else it’s just two people looking at a laptop. Give the photos context and meaning. Thanks for your post!! Great Information and I have retweeted on all my social media sites. I plan to use each point as a reference as ‘tweak’ my online social media platform. Great info Heather. I’ll be retweeting this! Reblogged this on Social Media for Nonprofits. Everything in this post is important, but I don’t think the absence of some of this features necessarily indicates a need for training. Maybe the company understands the need to be mobile friendly, but lacks the resources and money to make it happen. And maybe their audience isn’t on mobile, so it’s less important than focusing their time, money and energy on other things. Same for social networks. If a non-profit has little time and money, it’s better to focus on some social networks, rather than spread work and quality thinner over more networks. And I disagree that certain social networks are essential to all companies. But of course, there’s no excuse for some of the points you have here. If an npo doesn’t have time for those, or claims a lack of time or that it’s not essential, this is a serious issue. I think a lot of people forget that the basic rules of communications apply online as well. Social media is not a short cut.